Emissary is Book 1 in the Legends of the Realm series. The main character in this book, Hyam, turns twenty-one, loses his mother, and begins the journey of a lifetime to discovery about who he is. Thomas Locke (a pseudonym for Davis Bunn) is a fantastic writer. I love Davis Bunn’s book The Turning and was so excited to read this book. It turned out to be totally different than I thought it would be. I don’t usually read this genre (fantasy) but wanted to give it a try. 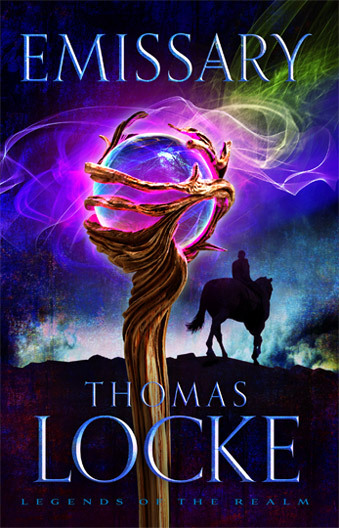 Thomas Locke did a wonderful job of creating a world, the Realm, and characters that were unforgettable. This story engages the readers with vivid detail and a complex plot. It is similar to Lord of the Rings and Chronicles of Narnia, but also like contemporary movies that involve characters with magical powers. I am not usually engaged by books or movies that contain magic, wizards, elves, etc., but this book wasn’t too difficult for me to read. If you love fantasy, you’ll love this one. I give this book four stars because of the quality of writing although it wasn’t my type of story.